These trends are entirely predictable. The most important determinant of lifetime retirement savings accumulation is the amount you are able to save during your working years. Someone who makes $200,000 can’t just save five times as much as someone making $40,000. In today’s world, the person making $40,000 often can’t afford to save anything, while the person making $200,000 can save the full $17,500 tax-deductible amount (and she is more likely to have an employer match as well). In the process, of course, the high-income person is also claiming about $6,000 in cash subsidies from federal and state governments, while the low-income person gets nothing. This entry was posted in Commentary and tagged 401(k), inequality, retirement. Bookmark the permalink. unless these charts somehow include the ‘balances’ associated with defined benefit plans I don’t understand how this shows anything about the ‘shift to 401(k) plans’. As I see these charts they’re simply explained by a divergence of income and thus savings ability. Thank you for this really excellent presentation. I have one quibble. 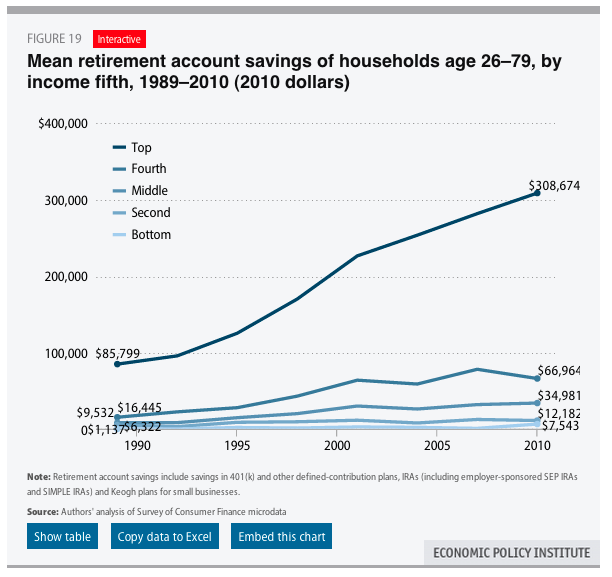 Retirement savings of people aged 26 – 79 seems a bit silly. What counts is the savings of people from, say, age 55 up, regardless of what they had saved in their twenties and thirties. The inequalities might turn out even steeper with such data. Let’s see if I understand this breakthrough analysis; people who save less and invest less will have less available to fund their retirement. Patrick, I think the point is, 401ks are less useful for those making $40k because the amounts they can save, if any, pale in comparison to the guys making six figures. The tax benefits certainly benefit the higher paid, some might even say, disproportionately. As a public employee, I was allowed to put money into a 401k in addition to my contribution to the defined pension plan. Swell. I was making less than 1/2 of what the mid-level folks made, so that $17,000 top limit on contributions (or whatever the amount was), that I theoretically could have saved tax deferred, was an unattainable goal. Add to that, no raises for 7 of 8 years, and I fell farther and farther behind. Isn’t there also a demographic effect here, as the baby boom cohort passes through the system (and presumably into higher income brackets, on average at least). I don’t see how you can read these without providing for age cohorts. think they are trying to say that if you make a lot you can save more than if you make less. and since we have basically made it so all must save to be able to retire at all, that we have made it so that unless you make a really good income, your likely to be unable to retire at all. replacing pensions with 401ks and the like only really works if every once can save enough to retire. and then you would need to account for how lucky you are when you retire. folks who were retiring back in 2008 – 2010, were among the most unlucky to ever retire since the 1940s. and they had nothing to do with why that was. i still dont see why we think savings vehicles are better than pensions. both use the same ways to invest (though pensions do tend to have few more options). one depends on professionals working full time doing nothing else, the only amateurs working part time on investments. why do we expect the latter to work better? @Let’s see if I understand this breakthrough analysis; people who save less and invest less will have less available to fund their retirement. No, it’s that in the end, money is actually a unit of time, and no one in recorded history has ever received more in 401k benifits, than they personally invested in over the most recent past. But put pen to paper, and make your logical conclusions, but unless you can account for the time factor, you are just juggling numbers, and running out of time. Yea, most people aren’t saving enough. But this analysis leaves out a lot. The majority of people have never had defined benefit pensions, so 401(k) are “replacing” something that most people never had. Also, defined benefit pensions aren’t free. Accounting changes some years ago required companies to start reasonably estimating how much they actually cost. This was a big driver to dropping them, and I suspect yet one more driver to motivate driving down headcount where they weren’t dropped. It would be useful to break out how much of the aggregated effect shown here is due to small business owners and professionals using 401(k)s for retirement savings who previously just bought stock, etc. without a plan. the ATT lineman or assembly line worker who had a pension plan 20 years ago and has a 401(k) plan now. Finally, the “tax deferred” nature of 401(k)s means that taxes are just deferred – not avoided. The $300K number suggested is not $300K; at 25% marginal rates the after tax value is $225K – the other $75K is going to be lost to taxes. 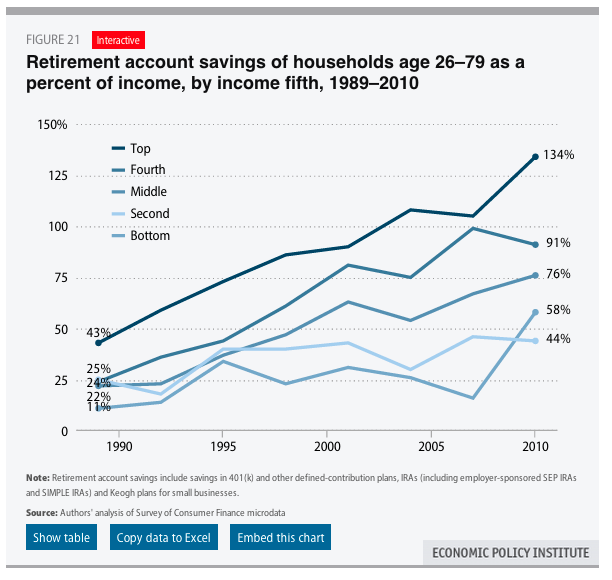 Besides the inequality, the actual amount of savings is inadequate for a retirement income except for the very top. And it can’t be adequate, the numbers don’t add up. They can’t add up. As a gross approximation, investments yield 10%. If you want to retire on half your income your need to save five times. Few people have the disposable income to do that. Retirement savings only work if you’re very rich or with speculation. Even if people did save, they’d just bid up assets and lower yields. Again as a gross approximation, mature companies yield 10% of revenue to shareholders. That can support roughly one fifth as many retirees as the working population at half pay. There are more retirees. 10% isn’t enough of a transfer from the working to the retired in the macro. Either companies need to yield closer to 20%, or it has to be taxes, or there will be raging inequality and old age poverty. 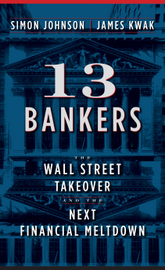 I still think Stanley Fischer is the best man/female for the job. But nobody from the White House called to consult me. Dammit all anyway. Well, let’s take our little victories whenever we can get them. Larry, thanks for realizing that licking the President’s rear end wasn’t going to save you from the embarrassment you were headed for in confirmation hearings. But Larry, seriously, maybe it wasn’t just because you’re a complete A$$ with the single social skill of brown-noser to fatcats….. maybe Janet Yellen’s mathematics skills were seen as far exceeding yours??? You can write a “white paper” on it and “explain” it to the rest of us Larry.